Henri Toulouse-Lautrec, Suzanne Valadon, Maurice de Vlaminck, James A. McNeill Whistler, and others. Maximilien Luce, and Georges Rouault. For a review of an earlier version of show that concludes, "Art exhibits in Madison rarely get this good," click review. Mary Cassatt was the only American to exhibit with the Impressionist group in Paris. A close friend of Degas, who immortalized her with his famous portrait of her working in the Louvre, she was not only an important painter, but a superb printmaker and draftsman, whose work shows the impact that Japanese woodcuts had on French artists, especially the Impressionists. 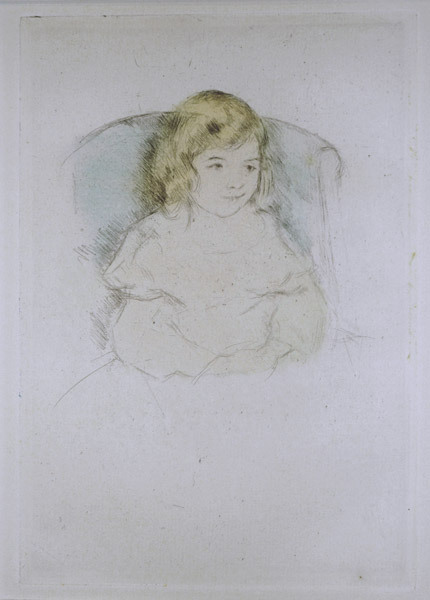 She is best known for her portraits of children and her groupings of mothers and their children. At the moment, Spaightwood has ten of her drypoints (one in two different impressions in black and white, two hand colored pieces in two different impressions, all of which are shown below. 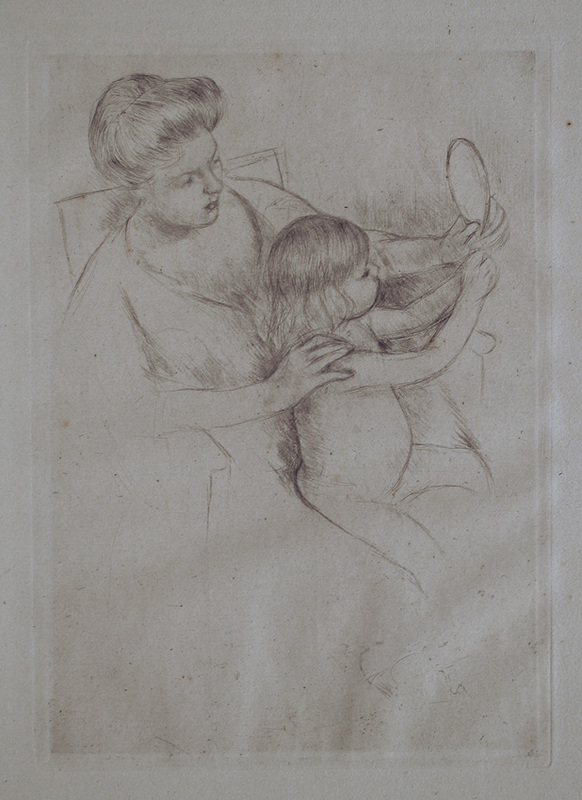 According to Cassatt's correspondence, she had originally only pulled one or two proofs from these plates. Nearly 20 years later, she found the plates in her storeroom and asked Eugene Delâtre, the best known printer in Paris at the time, to print a small edition of each for her. 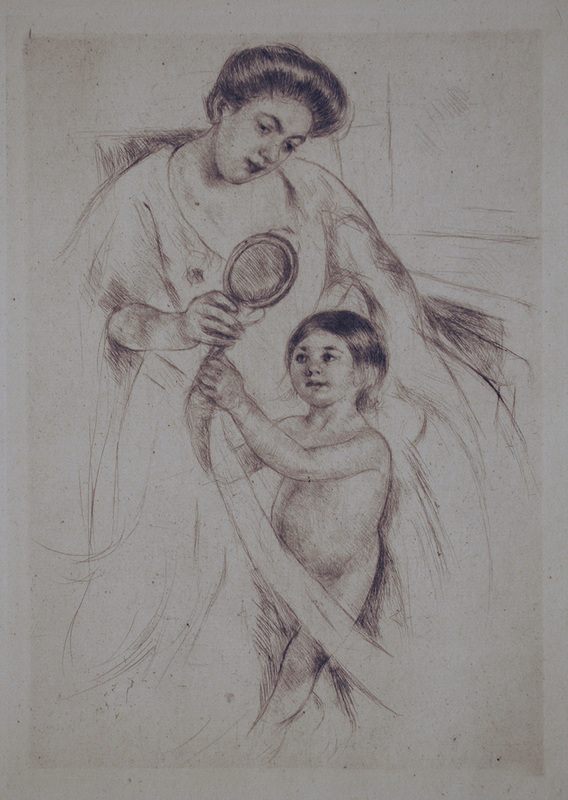 One of her patrons, Mrs. Havemeyer, insisted that since the plate had already been printed, Cassatt had to indicate that by dating the print when she signed it; Cassatt insisted that she had never printed the plate before and refused, accusing Mrs. Havemeyer of trying to cheat her by paying her less for the works as if they were second editions. Having refused to date them, she decided not to sign them at all (a not-uncommon way of publishing prints at the time: Chagall's Dead Souls etchings, printed between 1923 and 1927, were also unsigned as were many of Picasso's early prints (and all of his Vollard Suite etchings from the 1930s). In the fall of 2000, the collection of Cassatt's prints begun by Ambroise Vollard, who had succeeded Durand-Ruel as her dealer, was offered for sale. The prices ranged from over $500,000 for the colored etchings down to "under $10,000" for impressions such as ours. 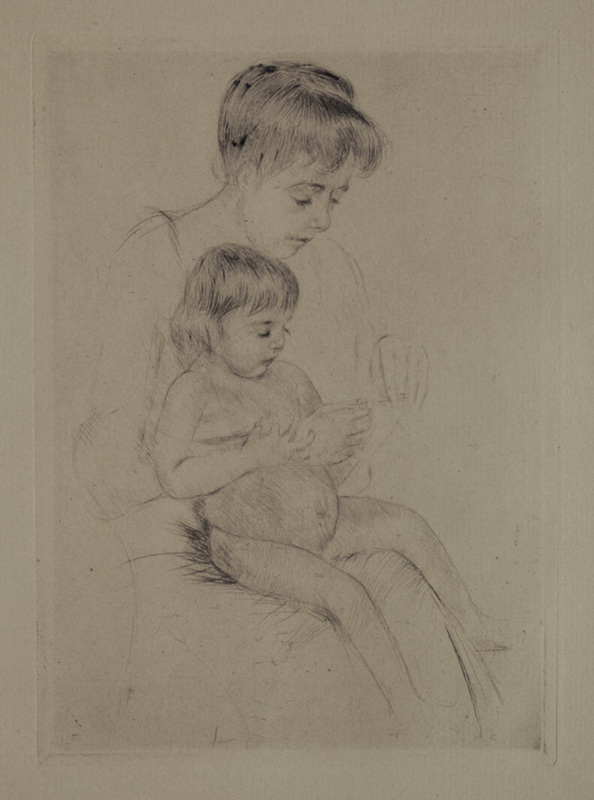 The show was accompanied by Mary Cassatt: Prints and Drawings from the Artist's Studio, a catalogue of the collection published by Princeton University Press discussing Cassatt as a printmaker. The National Gallery of Art and the Metropolitan Museum of Art between them, we have been told, purchased almost the entire collection and will undoubtedly be offering a major Cassatt retrospective in the near future. Coming on top of the recent retrospective organized by the Chicago Art Institute and memorialized in Mary Cassatt: Modern Woman (published by the Art Institute in 1998), it is clear that Mary Cassatt's place both in the Impressionist movement and in the history of American art are being revaluated upwards. A note on the photographs below: Cassatt especially liked papers that were blue-gray, gray, blue-green, or green tinted. The combination of paper and inks (and sometimes watercolors) resulted in prints with a large range of tonalities rather than simply black and white impressions. Although these are very difficult to catch in a photograph, they are stunning in person and explain why her peers were amazed at the tonal range of her etchings. Select Bibliography: J. A. Barter et al. : Mary Cassatt: Modern Woman (NY: Abrams / Art Institute of Chicago, 1988); Adelyn Dohme Breeskin, The Graphic Work of Mary Cassatt, A Catalogue Raisonne (NY: H. Bittner, 1948; 2nd edition: 1979); Adelyn Breeskin, Mary Cassatt 1844-1926 (Washington D.C.: NationalGallery, 1970); Adelyn Dohme Breeskin, Mary Cassatt: Graphic Art (Washington D.C.: Smithsonian Press, 1981); E. John Bullard, Mary Cassatt:Oils & Pastels ((Washington D.C.: NationalGallery, 1976); Frank Getlein, Mary Cassatt Paintings and Prints (NY: Abbeville Press, 1980); Nancy Mowell Mathews, Cassatt and Her Circle: Selected Letters - Mary Cassatt (NY: Abbeville, 1984); Museum of Graphic Art, The Graphic Art of Mary Cassatt (NY: Museum of Graphic Art, 1967); Griselda Pollock, Mary Cassatt: Painter of Modern Women (NY: Thames & Hudson, 1998); Marc Rosen and Susan Pinsky Mary Cassatt. Prints and Drawings from the Artist's Studio (Princeton: Princeton University Press, 2000); Barbara Stern Shapiro, Mary Cassatt: Impressionist at Home (NY: Universe, 1998). Margot wearing a bonnet I (B. 179). Original color drypoint, c. 1902. Printed for the artist in 1923 by Delatre. Only known state. Included in the Smithsonian Touring Exhibition, Mary Cassatt: Graphic Art. Ours is a very sharp and rich impression with very good fresh colors; this particular impression is clearly colored by hand, not as part of the printing process. Image size: 233x165mm. Price: $8950. Margot wearing a bonnet I (B. 179). Original color drypoint, c. 1902. Printed for the artist in 1923 by Delatre. A good impression with hand coloring. Image size:233x165mm Price: $7950. Margot wearing a bonnet I (B. 179). 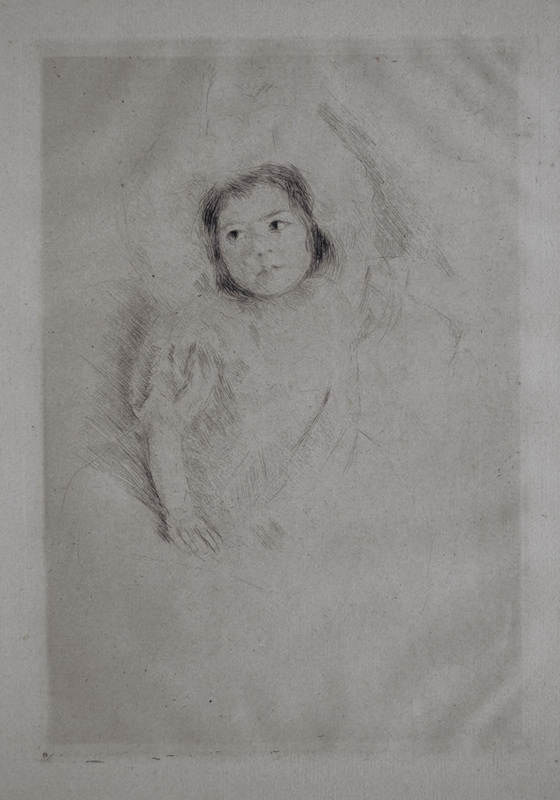 Original drypoint, c. 1902. Printed for the artist in 1923 by Delatre. Only known state. 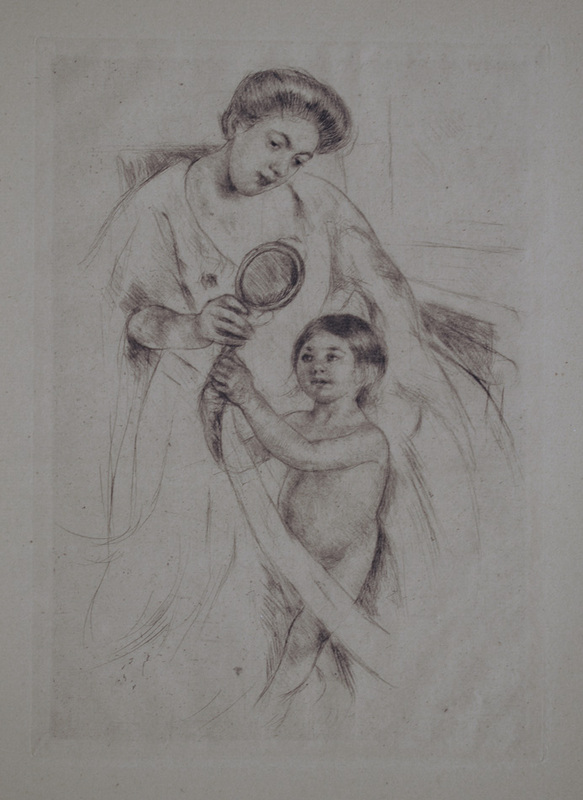 Cassatt often printed on paper that had not been sized to keep it flat; the picture to the left shows what happens when light is reflected differently from the many surfaces of the paper. Image size: 233x165mm. Price: $5425. 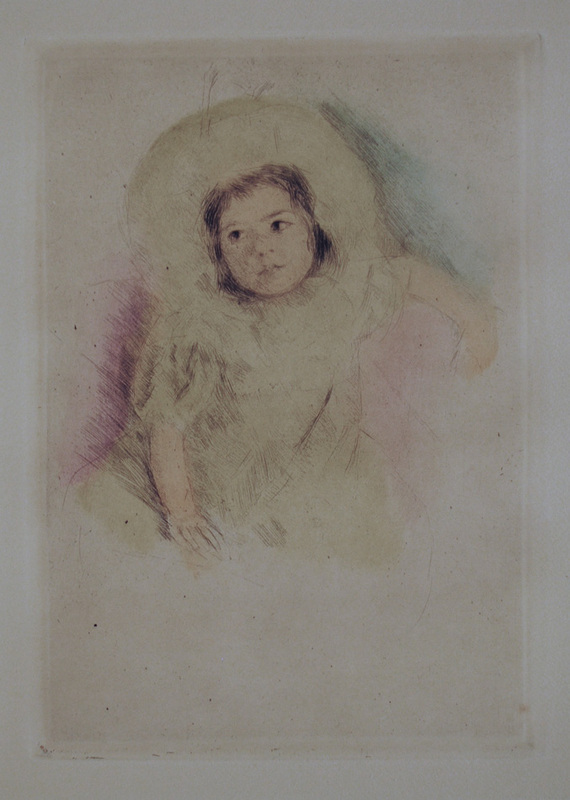 Margot wearing a bonnet III (B. 181). Original drypoint, c. 1902. Printed for the artist in 1923 by Delatre. Only known state. Included in the Smithsonian Touring Exhibition, Mary Cassatt: Graphic Art. Ours is a rich impression on Cassatt's favorite blue-gray color paper. Image size: 235x160mm. Price: $7500. Margot wearing a bonnet III (B. 181). Original drypoint, c. 1902. Printed for the artist in 1923 by Delatre. Only known state. Included in the Smithsonian Touring Exhibition, Mary Cassatt: Graphic Art. Ours is a very sharp and rich impression on Cassatt's light gray laid paper in which the lines to the left of Margot's hand print clearly and sharply with very good detail in the dark areas. Image size: 235x160mm. Price: SOLD. Looking into the hand-mirror II (B. 202). Original drypoint, c. 1905. Only known state. One of her most delightful images. Image size: 200x140mm. Price: $6500. Looking into the hand-mirror III (B. 202+). Original drypoint, c. 1905. Only known state. 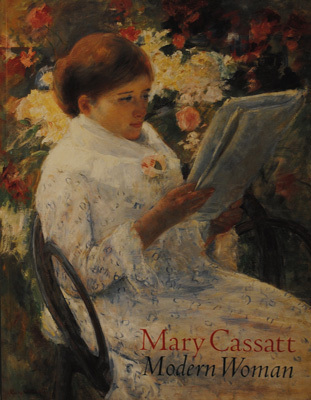 Included in the Smithsonian Touring Exhibition and its catalogue, Mary Cassatt: Graphic Art. A very good impression with strong contrasts and sharp detail of a somewhat rare piece, listed by Breeskin as "newly discovered." Image size: 208x147mm. Price: $7500. Looking into the hand-mirror III (B. 202+). Original drypoint, c. 1905. Only known state. Included in the Smithsonian Touring Exhibition and its catalogue, Mary Cassatt: Graphic Art. A very good impression of a somewhat rare piece, listed by Breeskin as "newly discovered." Image size: 208x147mm. Price: $6950. The Manicure (B. 199 ii/ii). 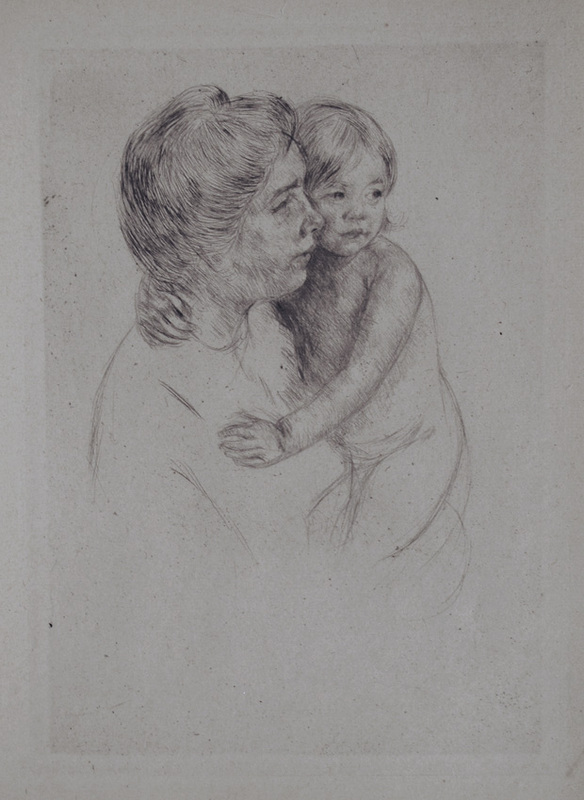 Original drypoint, c. 1908. A good impression with lots of detail in the plate. Cassatt was the only American to exhibit her works with the Impressionists. 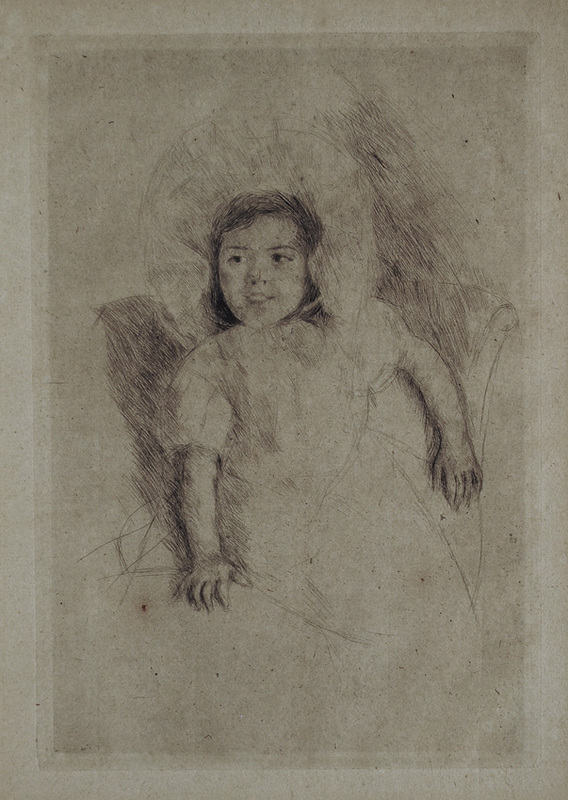 Her drypoints were quick sketches made directly on on copperplates and have all the immediacy of drawings. Image size: 209x150mm. Price: SOLD. Denise holding her child (B. 204 ii/ii). Original drypoint, c. 1905. Printed for the artist in 1923 by Delatre. One of the artist's most tender depictions of the bond between child and adult. A very fine impression on tannish-gray laid paper with an unreadable watermark: all lines print very clearly and there is strong contrast between the lines across the child's chest and Denise's hair and the background. 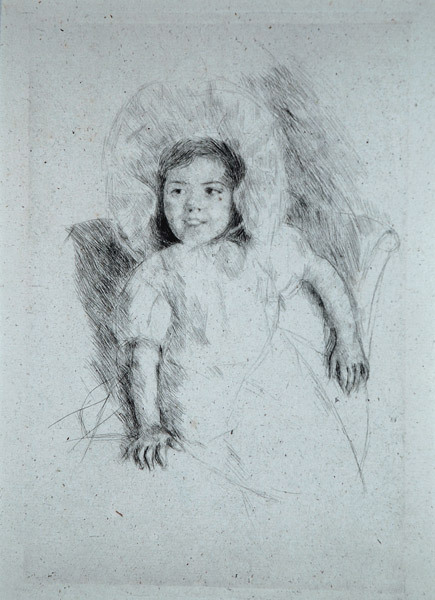 Like all of Cassatt's drypoints, good impressions (such as this) are scarce. Three rust marks outside the platemark not affecting the image and invisible when matted. Image size: 209x146mm. Price: $7500. Sara Smiling (B. 195). 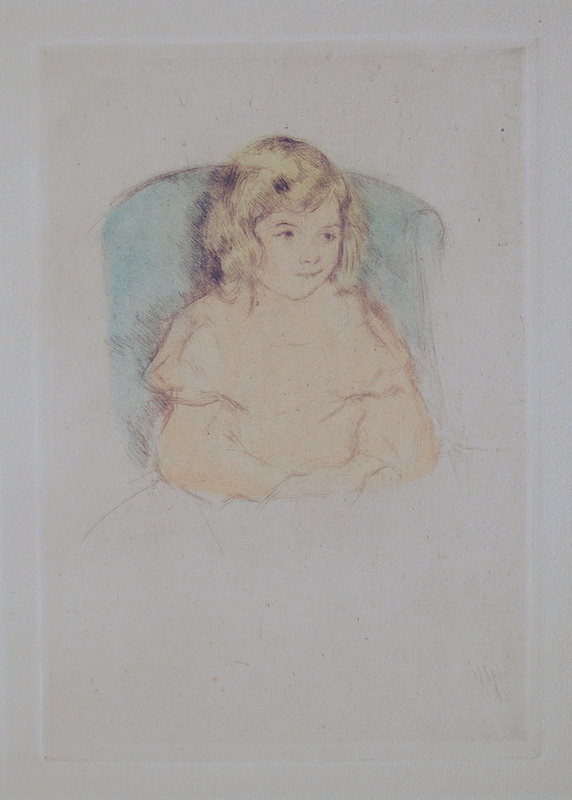 Original drypoint with hand-coloring, c. 1904. Printed for the artist in 1923 by Delatre. A good impression with fresh, unfaded, hand-coloring. Although Breeskin notes that "some impressions are printed in color," this particular impression in clearly colored by hand, not as part of the printing process. Image size: 196x136mm. Price: $7950. Sara Smiling (B. 195). 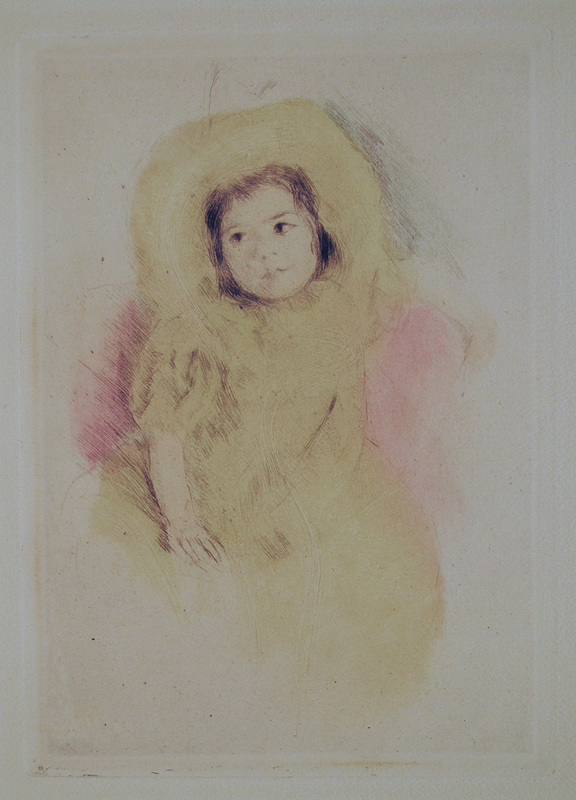 Original drypoint with hand-coloring, c. 1904. Printed for the artist in 1923 by Delatre. A fair impression with hand-coloring. Although Breeskin notes that "some impressions are printed in color," this particular impression in clearly colored by hand, not as part of the printing process. Image size: 196x136mm. Price: SOLD. Judith A. Barter, ed. Mary Casssatt: Modern Woman (Chicago: Art Institute, 1998). A 376-page large-format bok to accompany a traveling exhibition that began at the Art Institute, travelled to the Museum of Fine Arts, Boton, and then to the National gallery of Art in Washington, D.C. Lots of color photographs (pintings and pastels) and black-and-white photos (drawings and drypoints). We have brand-new shrink-wraped copies available at $27.50 plus $3.99 shipping. 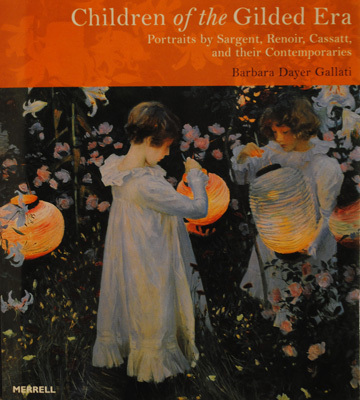 Children of the Gilded Era: Portraits by Sargent, Renoir, Cassatt, and their Contemporaries presents a compelling selection of children's portraits painted at the end of the 19th century - an age of Mark Twain, Henry James and Edith Wharton. The featured paintings by John Singer Sargent, Mary Cassatt, Lawrence Ahna-Tadema, Edgar Degas, and James McNeill Whistler, some of the leading artists of this pivotal period in the histories of the United States and Europe, offer an idyllic view of yesterday's childhood. Mint in dust jacket. 96 pages, 8-3/4x7-3/4 inches. Illuastrations mostly color. Price: $15.00 plus $3.99 shipping.